The PDF below is an informal investigation on the effect of image resolution and colour on the quality of the final 3D reconstructed model. 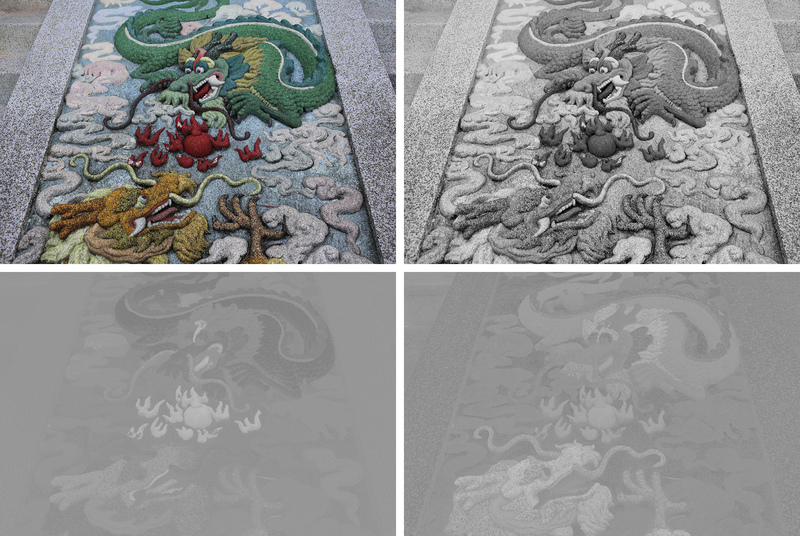 A photograph set is chosen that results in a high quality reconstruction, the images are progressively down-sampled and in one case the colour removed. Comments in the above about it being unexpected that the reconstruction from the greyscale images worked so well can be explained by the observation that the intensity plays a larger role in the image detail than the colour. This can be seen by looking at the YUV channels of one of the input images, see below. The regions of colour add very little to the spatial detail. Top left: original sample photograph. Top right: Y (intensity channel). Bottom left and right: u and v colour channels.